Dr. Eric Kmiec is Director of the Gene Editing Institute of the Helen F. Graham Cancer and Research Institute at Christiana Care Health System. He also holds faculty appointments at the University of Delaware and the Wistar Institute. He Received his B.A. in Microbiology from Rutgers University, his M.S. in Cell Biology and Biochemistry from Southern Illinois University, and his Ph.D. in Molecular Biology and Biochemistry from the University of Florida School of Medicine. He conducted postdoctoral research at the University of Rochester before joining the faculty at the University of California, Davis in 1987. Since then, he has served on the faculty of Thomas Jefferson University, the University of Delaware, and Delaware State University. In addition, Eric founded, consulted for, and served as Vice President of Kimeragen, Inc., he was Chief Scientific Advisor for the Genomics Division of Tapestry Pharmaceuticals, was an Eminent Scholar and Director of the Marshall University Institute for Interdisciplinary Research, and also served as Co-Founder, Chief Scientific Officer, and a Board Member of OrphageniX. Eric has received numerous awards and honors over the course of his career, including receipt of the 2012 Proudford Foundation Unsung Hero Award in Sickle Cell Disease, designation as an Honorary Commander of the 436th Air Wing at Dover Air Force Base in 2013 and 2014, and also induction into the Southern Illinois University, Edwardsville Alumni Hall of Fame in 2012. Further, Eric and the team at the Gene Editing Institute were recently awarded the inaugural Life Sciences and Bio Innovation Award from the Philadelphia-Israeli Chamber of Commerce. In our interview, Eric shared his experiences in life and science. Throughout his life, Eric has enjoyed sports. He particularly likes playing baseball and hockey, and he still plays baseball competitively in a league in Philadelphia. Eric also spends much of his time doing landscaping and yardwork. Eric and his colleagues are working to develop new ways to treat cancer by destroying the genes that cause cancer cells to be resistant to typical therapies like chemotherapy, radiation, or immunotherapy. In high school, Eric liked science, and he did well in his science courses, but he didn’t plan on pursuing a career in science or research. Eric played baseball throughout high school, and he went to college with the goal of becoming a professional baseball player. However, he was disappointed to discover that he wasn’t talented enough to make it in college baseball. Once Eric realized this, he began to focus more on science. Eric’s scientific interests were in microbiology and bacteriology, and he went on to earn his PhD studying genetic recombination in fungus. Over time, studying how chromosomes exchanged information led to his work in gene repair and gene editing. In the mid to late nineties, Eric and some of his colleagues began thinking about gene editing. This was around the time when research on gene therapy was booming. Researchers were adding corrective genes to viruses and injecting them into people to augment or replace the function of disabled genes or chromosomes. To Eric, this approach didn’t seem to address the cause of the problem. He proposed that they could tackle the problem at its source through gene repair. Initially, these ideas were dismissed as heretical. Eric and other labs pursuing gene repair spent years being mocked and trivialized by their peers. It was hard to keep going, but Eric really believed in the science. It has been rewarding to see how far the field has come and to see researchers who were previously working on viral gene therapy now working on gene editing. In the early days of gene editing, Eric struggled to wrap his head around how RNA participated in gene editing, but he believed it had to play an important role. While mowing the lawn with his son, who was six years old at the time, Eric was talking about this laboratory conundrum. Typically when Eric talked about his work, his son provided the sort of advice you might expect from a young kid, but this case was different. His son made an ingenious suggestion, and Eric’s team immediately got to work. This comment from Eric’s son helped clarify Eric’s understanding of the mechanism of gene editing and pushed his team to pursue lines of research in therapeutic gene editing that they continue to study today. In addition, Eric has been fortunate to work with some extremely talented students over the years. Currently, one of the graduate students in his research group is working on a project to further optimize their gene editing on a chip system. With this system, they can perform gene editing in a controlled laboratory environment outside of cells. This student is among the best experimentalists Eric has ever seen, and it has been wonderful to watch someone of that skill level continue to develop as a scientist. Eric has been fortunate to go to many memorable conferences and scientific meetings. In particular, he remembers attending some of the early Gordon Conferences in DNA Repair and Recombination held at a secluded boarding school in New Hampshire. The attendees were sequestered away, surrounded by nature, and there were no distractions like TVs, laptops, or cell phones. The goal was to communicate and connect with other scientists, and you really got to know each other by living in close quarters, sharing bathrooms, and spending days together talking about research in your field. As a graduate student, Eric also had great experiences attending meetings at Cold Spring Harbor. These meetings were 6-7 days of very intense science, but it was amazing to be surrounded by some of the best and the brightest scientific minds. For Eric, it was remarkable to turn a corner and run into some of the biggest names and pioneers in his field. He remembers listening to James Watson talk about the creative process, and this discussion really inspired Eric. Working alongside, listening to, and getting feedback from these accomplished scientists really had a big impact on Eric and his career. You have to accept failure as part of the learning process. It’s how you respond to failure that will enable you to succeed in the future, and it’s what you learned from your failed attempts that will lead you to success. Just keep going. If you have a good idea, keep fighting for it. Eric is well known for his pioneering work in molecular medicine and gene editing. 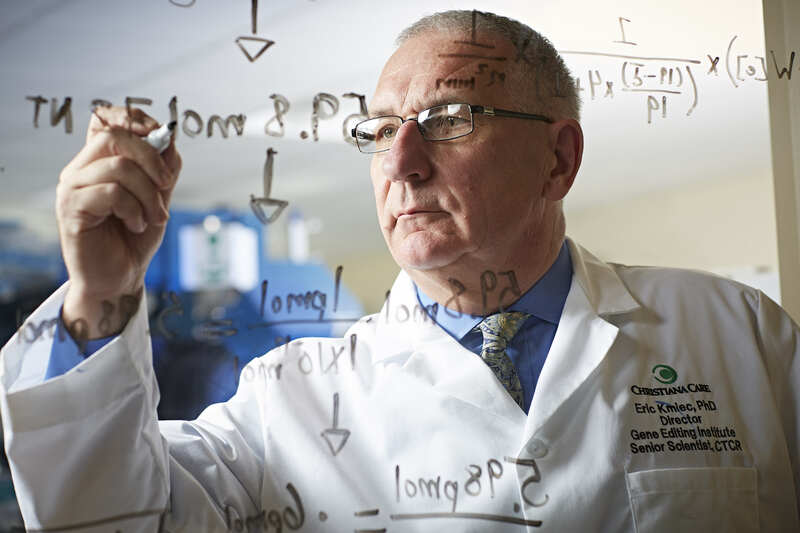 Under Eric’s leadership, the Gene Editing Institute has become a leader in gene editing and biomedical research in cancer and other inherited disease. It is the only institute of its kind embedded in a community cancer center where interactions among oncologists, genetic counselors, and patients regularly take place. Through this unique collaboration, innovative basic science discoveries in cancer research can be translated directly to patient treatment. Throughout his professional career, Eric has led research teams studying the reaction mechanics, biochemistry and molecular genetics of gene editing in human cells. His early work with sickle cell disease led to research and development of the next generation of gene editing tools, including CRISPRs (clustered regularly interspaced short palindromic repeats) and to even more promising variations such as single-stranded DNA oligonucleotides (ssODNs) for the treatment of inherited disorders. He has been a member of numerous editorial boards, NIH study sections and review boards and is the (primary or corresponding) author of more than 155 scientific publications (mostly in genetic recombination and gene editing). Eric holds 18 issued patents, most of which have been licensed by biotechnology and pharmaceutical companies and has founded two biotechnology companies. He is also a senior scientific advisor and SAB member of ETAGEN, a gene editing company located in Cambridge, Massachusetts, centered on the development of therapeutic uses of gene editing.